Make your own jewelry in our store! No experience necessary. Start with a little tour of our wide selection of beautiful, high quality beads. Grab a design tray, lay out your favorites, and put them on a durable string. We'll quickly secure the ends so you can wear your happy memory for years to come. We love families! 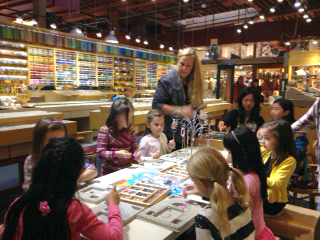 Kids make the most artistic creations, and many people raised in Vancouver tell us about their fond memories of making bead accessories in our shop as a child. If your group needs some extra special attention, or if more than 4 people want to string beads, please phone us in advance (604 682 2323) to be sure the table is available. We offer an all-you-can-make Beading Party (see description below) where parents can leave everything to us and enjoy the rest of Granville Island. $70 deposit required at booking, most parties run between 12 and 3 on Saturdays & Sundays. We book a time that works best for you. Minimum 3 and Maximum 10 party goers. Adults can party with beads too! Take a look at our classes page, and choose a project that suits your crew. Contact us and we will reply with a quote for a set price for each student that includes supplies. A maxium of 10 adults can fit at our table.